In today's health-conscious climate, game is increasingly considered a wholesome alternative to intensively bred domestic animals. It comes from lean,healthy, free-range animals which are low in fat and cholesterol. Most wild game has 5% to 7% fat, whereas lamb has 25% and a piece of prime beef can contain as much as 45%. When you eat game with a puree of vegetables at Rules, you are consuming a meal that is not only low in fat and calories, but high in fibre and protein too. And whereas domestic meat and poultry tend to have a rather predictable taste, game offers a huge range of subtle flavours, reflecting the varied diet of animals in the wild. Rules is fortunate in owning an Estate, Rules at Lartington Hall Park in the High Pennines, “England’s last wilderness”. Through its ownership of Lartington, Rules is able to source the highest quality game, exercising its own quality ontrols and determining the best way to serve Game, for instance the best hanging time to produce the best flavour. 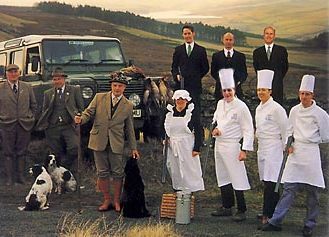 Game, once viewed as the food of the landed gentry is available to all who visit Rules and is today’s healthy alternative.